The SuperScript™ III CellsDirect™ cDNA Synthesis Kit utilizes a simple protocol that takes less than 2 hours. Lysis and reverse transcription are performed in the same tube, and the resulting first-strand cDNA is ready to use in cloning and PCR. In traditional RT-PCR, RNA is first isolated from cells in a time-consuming procedure that can lead to a loss of material. Using the SuperScript™ III CellsDirect cDNA Synthesis System, the cells are lysed and the cDNA is generated from the lysate in a single tube with minimal handling and no sample loss. DNase I is added to eliminate genomic DNA prior to first-strand synthesis. 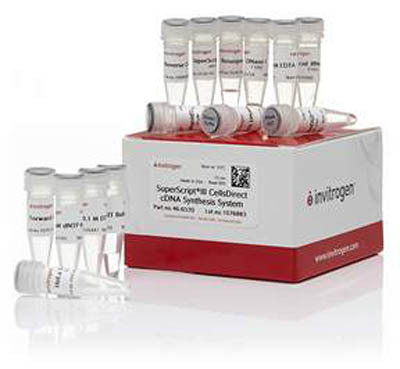 This kit has been optimized for small cell samples, ranging from 10,000 cells down to a single cell (as measured by serial dilution). The use of SuperScript™ III Reverse Transcriptase ensures high specificity and high yields of cDNA from small amounts of starting material—as little as 10pg total RNA. After synthesis, the first-strand cDNA can be amplified with specific primers by PCR without intermediate organic extractions or ethanol precipitations.